The Lodge is located deep in the bush, within the exclusive Mahlathini Private Game Reserve, which adjoins Kruger National Park on both Eastern and Northern boundaries. Located 7.5klms north of Phalabowra, Klipspringer Lodge is a comfortable 5 hour drive or 1 hour flight from Johannesburg International airport. 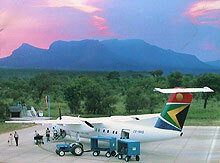 Polokwane and Nelspruit are only a picturesque three hours drive away. As your party has exclusive use during your stay you will never be part of a crowd! The lodge offers travellers a luxurious air conditioned, fully serviced, refuge from the modern world. Ann (owner/manager) is in residence to provide any assistance you may require. In addition to some of the world's best game viewing opportunities, the lodge is perfectly located to explore the surrounding, beautiful Lowveld area which is steeped in human and geological history. You are free to treat the lodge as your home away from home, while you enjoy this unique holiday experience. Klipspringer Lodge is less than 20 minutes from the both the main Kruger gate and the town of Phalabowra. Within Phalabowra you will find various gift shops, grocery stores, supermarkets and a range of dining options from take away to sumptuous.